New Zealand Grass-Fed Whey protein is sourced from cows that graze on all-natural, pesticide-free farmlands in the beautiful countryside of New Zealand, a country known for upholding the strictest quality controls for their dairy industry. The cows are never administered hormones or antibiotics, and the resulting milk proteins are processed using cold-water microfiltration and flash-pasteurized to ensure minimal exposure to heat. New Zealand Grass Fed Whey does not contain soy lecithin, and is instead instantized using sunflower lecithin. Providing 24g of protein to help support muscle-building! Uses: Supports Muscle-Building: Provides 24g of protein to help support muscle building! Mix-ability: Shake or stir thoroughly, as some clumping may occur. 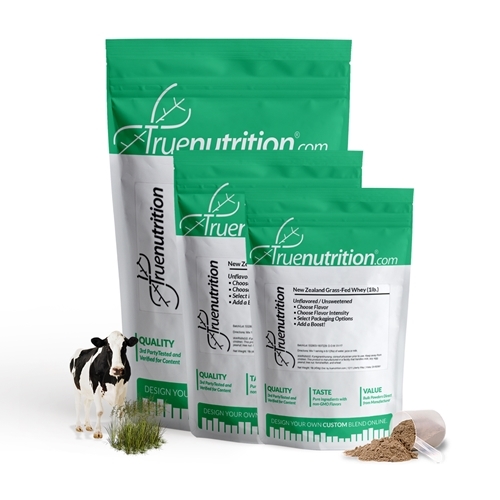 New Zealand Grass-Fed Whey (Milk), Lecithin (Sunflower). This protein is fantastic, and I've tried many out there on the market. The true flavor vanilla with the carb and protein enzyme is the flavor I always purchase. It tastes great with unsweetened coconut milk. For a meal replacement it tastes great mixed with true nutritions sweet potato cinnabon flavor powder. Great products. I have been on a very low carb diet for 9 months. I am used to stevia and other sweetener replacements. I chose the TrueFlavor chocolate brownie and the flavor is so bland. It's tolerable but I wouldn't say I enjoy it. I won't be ordering it again. The formula itself is very foamy like other reviews have stated. Natural Premium Strawberries & Cream is my favorite. I don't care for TrueFlavors. This product doesn't foam up like the standard Grass Fed Whey. Mixes easily, works great..what's not to like? I get the unflavored and unsweetened protein. I use a nutribullet and blend it with Greens and fruit and I love it. It is flavorless. I have purchased this protein several times already. You won't find a better value. Absolutely amazing taste and satiety! I got the key lime flavor as well as the dutch chocolate. Definitely will purchase again and again!